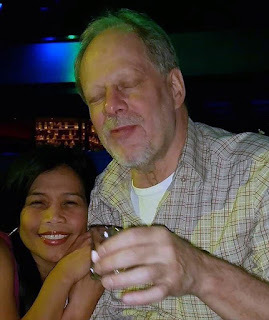 He snapped': Las Vegas shooter Stephen Paddock 's brother says that the family is 'dumbfounded', and has no idea of motive. Let's throw some spaghetti against the wall and speculate. Paddock is a multi-millionaire who made his money as a land developer in Nevada. ATF apparently approved his purchase of around a dozen fully automatic weapons. YET the federal government disavowed knowing anything about him. Really? InfoWars says the FBI found Antifa and ISIS literature in Paddock's hotel suite (two connecting rooms) at the Mandalay Bay. (true or untrue?) We do know that ISIS has taken credit for the shooting twice today. This will be fleshed out by law enforcement eventually. But the murderous progressive shooting rampage reminds me a lot of the situation we saw in Virginia, where James Hodgkinson, a left-wing activist, attacked Republican legislators who were playing baseball. (more here) The difference between the two events rests with the level of planning that Paddock took to position himself with fully automatic weapons. In both cases, the targets were pro-Trump people (if Country Music lovers can be blanketed that way). It's a stretch to characterize Republican Congressmen as pro-Trump as well, but the Progs tend to lump everyone into Hillary's 'basked of deplorables'. There are some interesting mixed signals out there regarding North Korea. 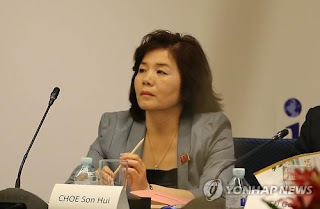 Meet Choe Son-hui, Director-General of the North American Department of North Korea’s Foreign Ministry. She's been making the rounds to Russia and China, pumping them for information on the likely and probable reaction of the US to North Korean actions. Director-General Choe’s participation in a meeting with Russian diplomats is noteworthy. North Korea has a very limited number of diplomats familiar with America, sometimes called "American handlers". Choe is one of them. 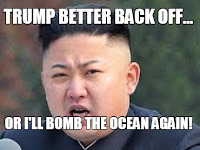 The word came down to Choe from Dear Leader, "What will the US do if we launch missiles at Guam?" Choe doesn't want to tell Dear Leader that the US will pound Norkland into dust without having some reassurance from the Chinese and Russians that it will happen. Dear Leader doesn't like to receive bad news and it's not uncommon that he'd have somebody like Choe fed to feral dogs or shot to pieces by anti-aircraft machine-guns. Prospects for substantive progress in any talks between North Korea and the US are very low, because North Korea has essentially called on the US to surrender. It might have worked with Obama but not Trump. However, it's not "talks" that North Korea wants, it's a prediction of cause and effect. The defector website Daily NK reported that its sources said that North Koreans are weary of the compulsory anti-US demonstrations. Fearing a popular backlash, the regime leaders have stopped the large public displays. The sources also said there are no war preparations being taken by the civilian population in Pyongyang and other cities. The sanctions have made satisfaction of daily necessities more difficult and time-consuming, so households have little enthusiasm demonstrations. Popular resistance occasionally can restrain the worst abuses of the North Korean leadership. 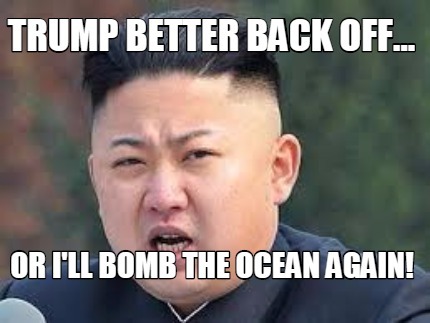 North Korea is not expecting or preparing for a US attack. It is preparing for chuseok, the harvest festival, on 4 October – a single day in North Korea. After that, it will be preparing for winter. Winter is the season of great privation in North Korea. A bowl of gruel per person per day is the standard fare for North Korean workers during winter but sometimes they don't even get that and they starve. Many die of starvation. It's just how life rolls in the Hermit Kingdom, but sometimes the unappreciative people in North Korea think that they are due TWO bowls of gruel per day and we've seen military units mutiny and the peasants get restless. The only fat man in North Korea has found that launching missiles compensates for a lack of food. And this winter, with tighter sanctions, it's unlikely that China will pitch in and send food for free as happened in other years. Half way through winter when the people's gruel ration is slashed (while Kim Jong Un feasts on prime rib), mandarins in the US and elsewhere feel that North Korea will launch a few missiles and test another nuclear weapon to buoy up the spirits of the starving population. And if they launch them at Guam - say, on Christmas Day, they want to know what the US will do. Choe could tell Respected and Beloved Dear Leader that a historical example could be found in what happened to Japan after the attack on Pearl Harbor in the run-up to Christmas. But I don't think that's the answer that he wants.